Dalton Shaffer deserves a promotion. On the other side of the line were Julie and Rich Morgan of Indianapolis, who lived in Battle Creek more than 20 years ago and, in their opinion, still hadn't found pizza as good as Steve's. The pair had planned a trip back to their favorite pizza spot, but had to cancel it due to Rich's ongoing battle with cancer — he's now back at home with friends and family under hospice care. On Saturday night, Julie's father decided on a whim to give Steve's a call even though they don't take delivery orders, and certainly not three-and-a-half hours away. That's when Shaffer answered the phone. He told "GMA" he didn't think twice about what the right thing to do was. He just asked what their favorite pizza was and got in his car, beginning his long, arduous journey at close to midnight. He drove about 450 miles round-trip and made it back home on Sunday at around 8 a.m. Caffeine was key, he joked. "I really didn't want the story to get this big," he said. "It's too late now, but a lot of people have told me how inspiring the story is and that makes it all worth it." Shaffer also didn't tell people at his job what he was doing or where he was going — not even his uncle, who owns the restaurant. "I did call my brother," he said, laughing. "I said I'm gonna be in Indianapolis, if something happens to me, thats where to look. I wasn't expecting anybody to find out." Then on Tuesday, Julie decided to post the amazing story to Facebook. Since then, the post as been shared more than 3,000 times. "Rich is home under hospice care and we are enjoying every minute reminiscing and visiting with family and friends," she wrote, telling the world about how her and her partner never forgot about Steve's Pizza. "[Early Sunday], while Rich and I slept, at 2:30 a.m., Dalton rolled into our driveway, left the car running and delivered two extra special pizzas to my waiting family. He told them we were in his prayers, and offered to help in any way he could." 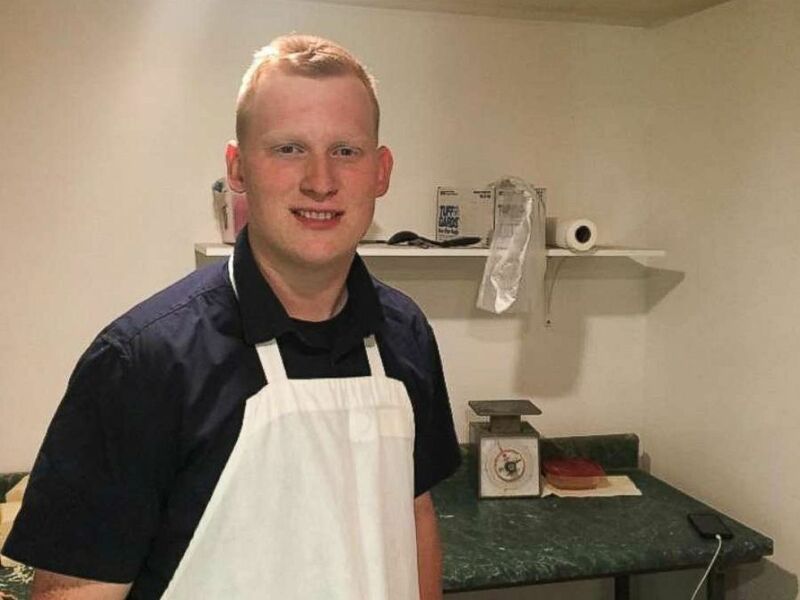 A pizza store employee, Dalton Shaffer, decided to drive 7 hours roundtrip to deliver a terminally ill man his favorite pie. Julie's father tried to put the boy up in a hotel, but of course, he declined, not looking for anything in return. He also refused payment for the pizza. "I am beyond overwhelmed and humbled by this act of genuine kindness. Dalton brought our family so much joy — and the best pizza in the world — at a really difficult time," Julie added in her post. And even though Shaffer and Julie Morgan have yet to meet, he said the two have been texting and that "she was shocked." "Just a bunch of emotion and gratitude towards me. It's been really great," Shaffer said. Morgan told "GMA" that she's glad most of the story has been about this young man and what he did out of the kindness of his heart. "I’m sure he is a blessing to many others besides us. I really didn’t believe it when they told us what had happened," she said. "I was just overwhelmed that a stranger would do that for us. He drove over seven hours total after working all day!" As for the pizza, she said, it was "as good as we remembered!" One pie was topped with pepperoni and the other was with pepperoni and mushrooms. As news of Shaffer's heroics started to make the rounds, one person in particular gave him the first call. "The first person was my uncle, he's the owner of Steve's, he texted me one night and wrote, 'We need to talk to you,'" Shaffer said. No, he didn't get into trouble for his good deed, his uncle just joked "That was quite a stunt you pulled," adding that he was proud of his nephew. Since then, Shaffer has been interviewed by countless local and national media outlets. He told "GMA" that his dream has always been to help people, with aspirations of being a police officer in the near future. "I'm still shocked [myself]," he said. "I was not expecting any of this."